I’m really taking a liking to good eBooks lately… and perhaps that’s because I see more of them being published by fellow photographers and enthusiasts. 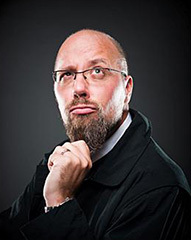 On the forefront of this new craze is David duChemin with the Craft & Vision website. He just authored a new eBook titled “Vision Is Better” and I had the opportunity to check it out before it was released. While I’m still working my way through it, I’ve read enough to share my thoughts here on the blog. This thing is a really good read and it provides a lot of insights not found in other books I’ve read. “Vision Is Better” can be purchased through Craft & Vision. The links in this post are affiliate links. 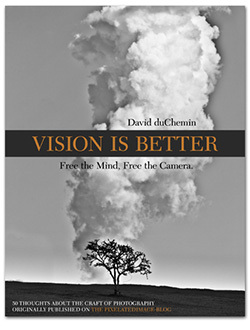 [tweetmeme]Vision Is Better is a 116 page downloadable PDF eBook available for only $5. The book contains 50 articles alongside supplemental photos. The layout is a basic 2 column/page format, and the simple design is easy on the eyes. Each article has a different color scheme and/or background photo, so every page seems to be a new visual treat. I agree with that last line — it’s worth the time and money. This isn’t a random collection of published blog articles — I’m sure there was some amount of thought put into which articles to include and in what order. Add to that, the completely different layout and design intended for your viewing pleasure, and it’s worth more than the $5 price tag. Though I don’t know him personally, David seems to be quite knowledgeable on the topics that he photographs and writes about. He’s also the mastermind of the growing Craft & Vision enterprise. The concept of the site is to provide high quality eBooks at a flat rate of $5 per publication. It’s a pretty hot deal and the model seems to be working, so check it out! As I mentioned above, the book is worth more than the $5 price tag. Just having this collection of articles all in one place is awfully handy. The book is more of a casual read, intended to be taken in over time and over multiple sittings. There’s not a bunch of technical stuff buried in there, just lots of essays and thoughts on becoming a better photographer. I would recommend this book to anybody looking for a little mental exercise. It should get you thinking about the important things in this field, and it may alter the way you look at professional photography. David also writes in a very conversational voice, so it’s really easy to follow along and wrapped up in his stories. Between now and May 4, 2010 you can get this book for just $4. Use the promotional code VISION4 when you checkout, or you can use the code VISION20 to get 20% off when you buy 5 or more books from the Craft & Vision collection. This entry was posted in Features, Reviews and tagged book, book review, ebook, photography, review, vision, vision is better on April 29, 2010 by Brian Auer.